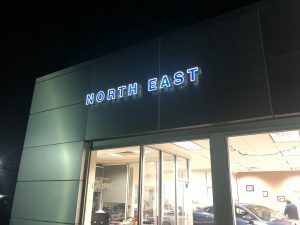 It is more than a slogan, it’s a habit here at North East Ford. It means we fashion to your needs like a tailor. The inventory is more then just vast, look at the commercial units, the trucks; the pre-owned vehicles at such affordable prices. These truly are hand picked not by what we want to sell but by the needs of our busy customers. We have the reputation that we can get anyone approved, but that is a team effort, our customers are empowered and included every step of the way. It’s you that makes it happen, we simply are at your assistance regardless of your past history. Our North East Ford Pledge means that when you come in for regular service you receive a complete no charge report card on your vehicle’s health. All that within one hour or it’s free. We are actively selling vehicles to municipalities, contractors and large estate holders. What makes them all so unique is easy to see; stop in on a Saturday and you will see all walks of life sitting in our lounge with their dogs and children in the play area.